Chunk o' cash for new baby's college, but the market's at a peak. Help? We had a baby recently and through several fortunate events have a nice little lump sum that we want to stash away for the kid's college fund. But the market is riding high right now, so it seems like a bad time to plunge it into investments, right? What do I do? Because of some happy circumstances with taxes, lump gifts from family, etc., we have about 20K in cash stashed away for our 6 month old baby's college fund. It's sitting ready in a high-yield savings account, and I've already set up a good state 529 plan, but I don't know a ton about investing and I am wondering if it's just crummy timing to put that cash into an investment right now, when the market is at a peak? Or does it even matter since we'll be withdrawing it in 18 years? I don't know a ton about investing, so appreciate basic advice. Thanks! Isn't this the sort of thing treasury bonds are best for? A guaranteed pay out after a specified amount of time? If you don't know a ton about investing, how on earth will you figure out when it is a good time to buy? If the market takes a nosedive tomorrow, and by next Thursday you think it's a good time, what makes you think the market won't continue to drop, making Thursday a bad time? Or if the market keeps climbing and climbing, when will you decide to bite the bullet and finally buy, kicking yourself for not doing it weeks or months or years earlier? Even experts can't do this-- you'd be foolish to try. You're betting on the fact that the market will, over the next eighteen years, rise. 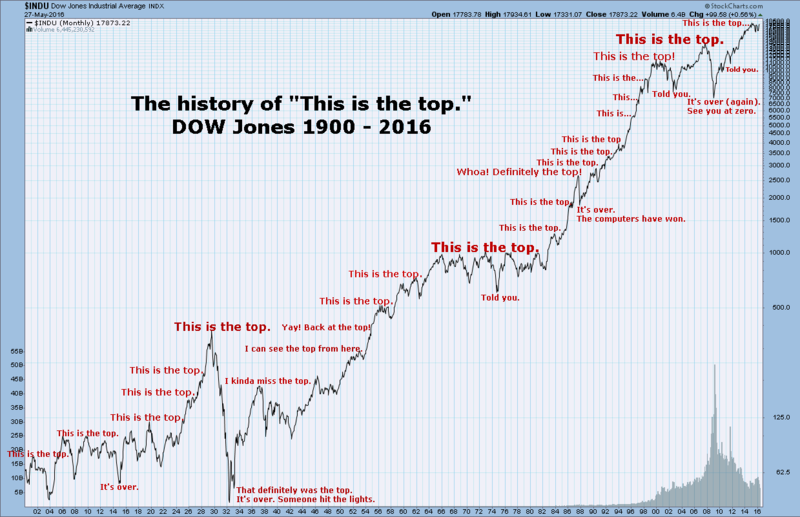 For that to be true, the market cannot be at a "peak" now-- it's just a point along the way. Also I strongly suggest not looking at your investment account or closely following the stock market in the weeks/months after you invest for the first time-- it'll just drive you crazy, and it's completely pointless. We do not know if the market is at a peak right now... it may go up or down from here. Historically, the market has gone up over the long term. If you look at a map of the performance of the S&P 500 over time, you'll see that even if you had invested right before the crashes, you'd still be well in the black as long as you did not panic and sell. You cannot time the market, so the general advice you'll get from places like Bogleheads is that the best time to invest is today, no matter when "today" ends up falling in the lifecycle of the market. You're better off investing now and letting it ride. You don't need to use it for 18 years, so you'll likely ride quite a few big ups and downs before then. Like the others have said, you can't time the market. "The best time to plant a tree was fifty years ago. The second best time is today." Same principle applies to stocks. Have a look at market tracking fund. Diversification is the traditional way of dealing with this: putting a portion of the money into an index fund and a portion into bonds or a bond fund, or even leaving a portion of it as cash. If it makes you more comfortable, you could also try dollar cost averaging - divide the money into six parts or however many you like, and buy stocks with one part every month for the next six months. That's been shown to have some benefits over the long term, but I don't know if it would do much in a short time scale. Still, if you strongly expect some disturbances over the next few months it might be more comfortable to do something like that - it guarantees that some of your money will be invested when the market is relatively high and some of it will be invested when the market is relatively low, and so smooths out the risk profile somewhat. I think that Dollar Cost Averaging is one way to deal with this worry. Basically, you invest a fixed dollar amount each month, so you buy more shares when the market is lower and fewer when the market is higher. It insulates you from fluctuations and the worry of picking the wrong moment to invest, but by it's nature, also blunts any good fortune of picking the right one. However, picking the "right" moment is statistically/historically very difficult. I'd do dollar cost averaging by putting the money in an index fund, then throwing $500 every once in a while (three months? six?) into the 529. I think Vanguard et al might even let you automate this. Dollar cost averaging = a psychological trick to make you feel like you're doing something smart, in the face of absolute uncertainty. As stated in mercredi's link, empirical research has found that it's a sub-optimal strategy in comparison to investing all of your money today. And definitely don't do it if you're paying a flat fee on every trade. Psychological tricks aren't necessarily bad-- investing can be scary-- but please just know that there is nothing inherently better about this method. It could be better, could be worse, and there's no way to know. Frankly if it stresses you out to decide whether to buy today or tomorrow, dollar cost averaging (unless automated) requires making that choice every month or so until you're done... not fun. That's not how dollar cost averaging works, that's the dream scenario. It's just as likely that you'll buy some shares when the market is "high" and other shares when the market is "even higher". FWIW "you buy more shares when the market is lower and fewer when the market is higher" is just intended to be descriptive of how you will get a different number of shares for a fixed dollar investment in a fluctuating market, not a prediction of a specific average result. You can't time the market. You don't know that the market is at a peak. It could keep going higher and higher. Just invest it already! In a 529 plan you're not going to have very risky investment options. If you're feeling particularly risk averse, many 529s allow you to choose a less aggressive fund option. However, when your baby is 6 months old is the best time to be aggressive with your investments. I have a 529 going on an 8 year old that I've made an 18% return on after investing in the aggressive fund option for the first 5 years of his life - so yeah, I did happen to get lucky that he was born right when the market was in a trough, but in order to beat the rates you can get on a high yield savings account right now, you don't need to get anywhere near 18%... you're probably making, what.... 1% on that right now? It's a guaranteed return, but... you're not even keeping up with inflation at that rate. Historic stock market returns over the kind of time horizon that you're looking at are much higher than that. Personally, if I were making a decision on this, I'd run a trend line back 15ish years and see where the market is today relative to that average growth. If the current price was more than 5% above that I'd wait before buying in. Probably not the best option, but I find my psychological well being to be worth quite a lot of money and there is no way I'd have peace of mind otherwise. I have a 1 year old, a 529 account, and a great understanding of investing. If I were in your shoes, I'd toss it all into the 529 today without a second thought. The market is at an all-time high a lot of the time, because the market mostly goes up. Also we can say with near-100% certainty that there will be at least one substantial crash before your kid uses the money. It's disheartening if it happens right after you invest a big chunk of change, but it doesn't actually matter that much so long as you don't panic and take the money out. "This is the top" illustrates the concept nicely. Also a dad with a 529 and a lot of investing experience and I concur that you should put it all in the 529, ASAP. Low fee index fund or with an 18 year horizon be riskier and go for a growth stock fund. I do dollar cost averaging, as people have mentioned above. You can do it with Vanguard or Fidelity by setting up automatic purchases - like $x every month or quarter into x fund or ETF. Both Vanguard and Fidelity have no-transaction-fee choices in mutual funds and ETFs, so you don't pay any extra fees by using DCA. I think you can set up an auto-invest into a 529 with Vanguard. I get the point that DCA may just be a psychological trick that is suboptimal, but it's a good trick for maintaining discipline over the long term, which is what really matters when investing. Basically, if the market goes up or down, I buy. If the market falls the day after I buy, it's not my "fault," it's just the day the trade happened to go through. I don't kick myself and think about selling, I just let it go - and buy again the next month. If I get some new cash to invest, I throw it into the auto-investing hopper and let it get pushed into the market over time without thinking about it again. If you can just plug it all into the market in one swoop and not worry about it or get temped to mess with it - by all means do that. But if you need some help with the psychological discipline, DCA with automatic purchases is great -- less so for the "averaging" than for the routine and discipline. Here's a Vanguard PDF that says "for best performance, invest it all at once." Thank you so much everyone! Dumping all the cash in the 529 today. Y'all are the best, and I feel so much more confident. My little boy's college fund thanks you! Just to follow up, the psychology of investing is, really, the most important thing. Loss aversion is extremely powerful. Some very risk-averse people are better off putting everything into CDs or Treasury bonds, because it's too difficult, psychologically, to tolerate the risk of losing money in the market. I know a family member who panicked during the 2008 crisis and sold all their stocks. Probably cut their lifetime income by 40%. Their advisor was good, in terms of selecting appropriate investments, but bad at the psychology. If anyone else is looking at this question, wondering what to do, my only advice is to know thyself. Because the market is going to gyrate, wildly at times. If you're the type who says, oh, investing everything right now is the optimal strategy according to the math, and can live with yourself if the market drops 20% tomorrow, go for it! (Also, consider that you might have the right temperament for high-stakes poker.) But for most people, the best "investing strategies" are really psychological tricks to short-circuit flaws in reasoning. Dollar-cost averaging, as mentioned above, tricks you into thinking you're buying more shares when the market is down, and fewer when it's up. Index funds are a way to relieve yourself from the delusion that you're a good judge of a stock's prospects. One of the most important things most people can do is just stop checking the damn thing so often. I check most months, but I wish I could make myself check less often.